Daily fantasy basketball has soared in popularity recently, with DraftKings offering perhaps the widest range of games in the industry. That means it’s important to develop a DraftKings NBA strategy that is tailored specifically to the site. Daily fantasy basketball is unique in that there’s not only a lot of player consistency from year to year, but also from night to night. Unlike baseball or football, basketball is a game that lends itself to day-to-day player consistency. Because of that, many daily fantasy basketball players like to grind it out in head-to-head games on a nightly basis. Since the players are so predictable relative to other sports, it’s easier to guarantee a certain “floor” of production that helps win head-to-heads, 50/50s, and three-man leagues. Editor’s Note: If you haven’t yet created a DraftKings account be sure to use DraftKings Promo Code “RotoGrinders” when signing up. Not only will you receive a 100% deposit bonus, but you’ll also get a 3-month subscription to our DraftKings premium product ($75 value) for free! Just email support@rotogrinders.com once you’ve made your account. The consistency inherent to daily fantasy basketball also drastically alters the appropriate strategy you should implement. Let’s take a deeper look at DraftKings NBA strategy. DraftKings requires that you start one point guard, one shooting guard, one small forward, one power forward, one center, one guard (any type), one forward (any type), and one utility player (any position). 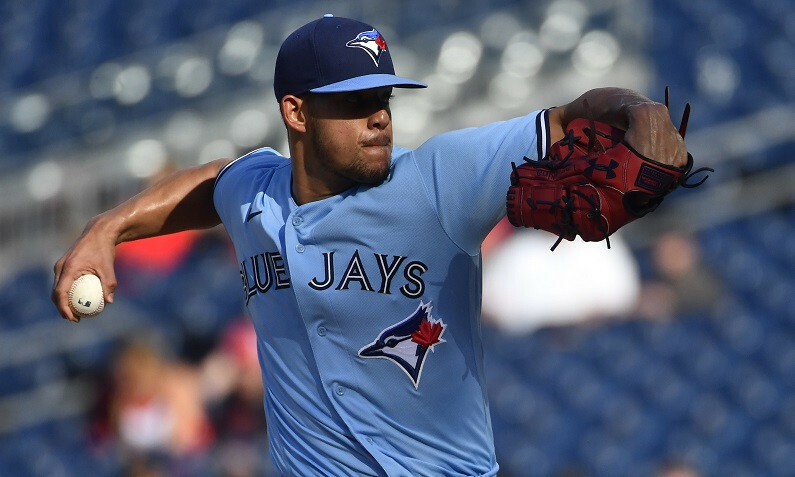 This is a really unique blend of starters and it results in a lot of different options for daily fantasy players. The guard and forward positions allow players to select from two different categories of players, very much akin to a running back/wide receiver flex spot in football. Those semi-flex positions, combined with the full flex characteristic of the utility spot, results in a greater level of skill required to win a league. Whereas you don’t need to choose among players from different positions on some sites, you do on DraftKings, and that alters how you need to think about players. Whereas it’s relatively easy to compare one point guard with another, it’s a different story when comparing a point guard to, say, a center. Thus, daily fantasy basketball players on DraftKings really need to project players together so that they can make accurate comparisons among positions. Further, certain positions are more likely to rack up certain types of stats (a center is more likely to block shots than a guard, for example). Depending what type of league you enter, you should seek different types of stats. We have more information on stat consistency in GrindersU, but the point is that you should approach the utility position differently based on your goals. Certain positions and types of players are naturally more or less consistent than others. DraftKings implements a “bulk” scoring system in that you don’t lose any points for a lack of efficiency. On some other sites, players lose points for missed shots, which really changes how you should approach player selection. Because that’s not the case on DraftKings, you should be more concerned with bulk numbers than efficiency. There are a couple unique pieces of information here, the most important of which is that you get 0.5 points for three-pointers on DraftKings. 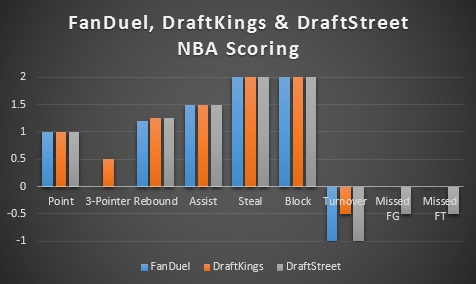 Check out how the scoring system compares to FanDuel and DraftStreet. Neither FanDuel nor DraftStreet award a point for a made three-pointer. That very much inflates the value of three-point shooters at all positions. Not only do you get the extra points from three-pointers, but those points can give you a significant advantage over other players who aren’t implementing the scoring system into their lineups. Many players treat daily fantasy basketball strategy the same on every site, which is a big mistake. By emphasizing three-pointers, you’ll have a leg up on a lot of novice players. Also take note that DraftKings doesn’t penalize as much for turnovers, weighting them at just 50 percent of the total lost points on other sites. Thus, you can really target aggressive players who post points in abundance, worrying less about efficiency than on any other site. Finally, DraftKings gives 1.5 points for double-doubles and three points for triple-doubles. The latter accomplishment is going to be difficult to predict on a nightly basis, but the bonus for double-doubles adds a little value to well-rounded players. 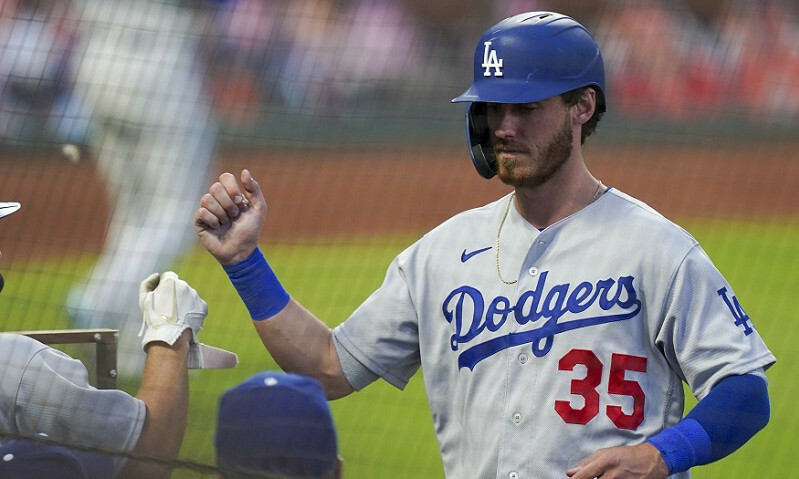 Players who thrive in a number of statistical categories should get a little bump in your DraftKings rankings. 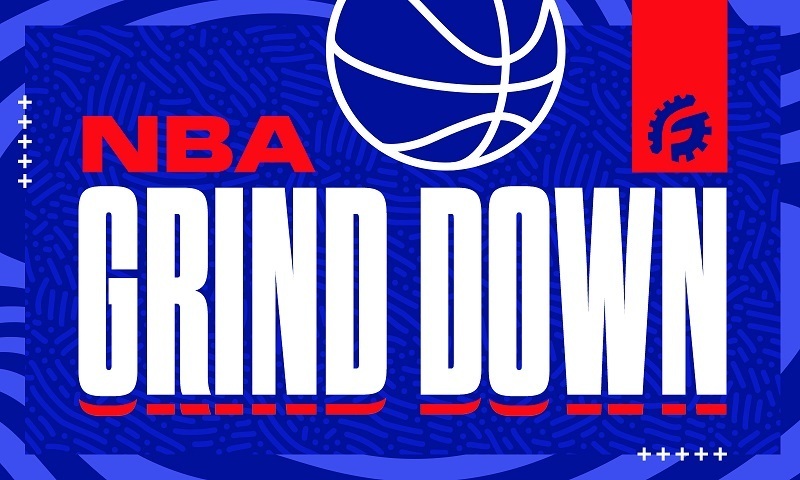 We have an article in GrindersU that suggests the best places to play certain types of daily fantasy basketball leagues, and DraftKings is listed throughout the article. It has become a popular destination for all league types, especially tournaments with a lot of users. In tournaments in a lot of other fantasy sports, players utilize a strategy known as stacking—pairing teammates from the same professional team together to increase upside. In daily fantasy football, for example, it’s common to see a quarterback paired with one of his wide receivers in large-field leagues. In baseball, you might see a 2-3-4-5 hitter combination from the same team. In daily fantasy basketball, however, stacking isn’t nearly as common. Because the players have such high floors, it’s difficult for teammates to have elite performances in the same night. If one player scores 40 points, he’s necessarily “stealing” points from his teammates. That’s not the case in football, as a receiver’s production is actually dependent on his quarterback, or in baseball, where the production of one hitter is also linked to that of his teammates (and the opposing pitcher). Because of the relationship in production among teammates, some daily fantasy basketball players actually do the opposite of what they do in other sports by stacking teammates in head-to-head leagues but not stacking in tournaments. The idea is that you can increase the floor of your team, which is a good thing in head-to-head leagues, by using teammates since they’re unlikely to both have poor games. Meanwhile, since you need an elite score in a tournament, it makes sense to not limit your upside by stacking teammates who are “stealing” points from each other. Whenever you’re picking players, especially those in the same game, you should use the Vegas lines as a guide. We have a lot of information on using the lines over at GrindersU, all of which should help you know when it’s okay to stack and when you should avoid it. The RotoGrinders NBA Tools are also a great place to start. Nice breakdown. 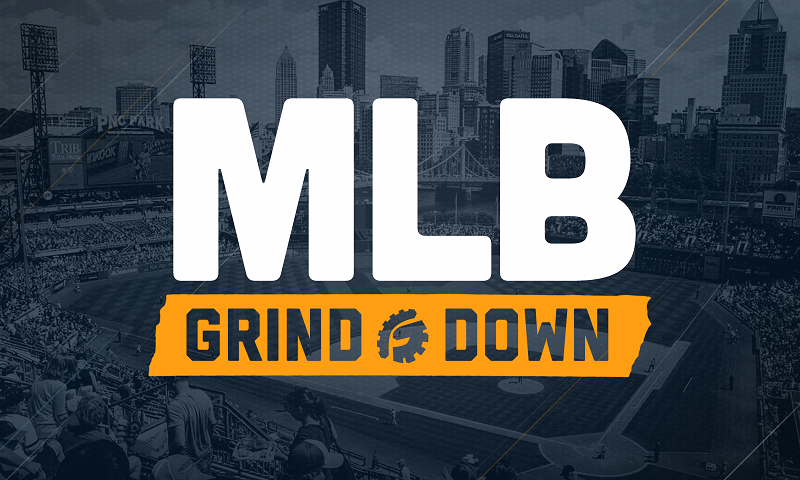 I have dabbled in the NBA DFS, but could never seem to quite get comfortable with it, as I am in NFL, MLB. You’ve inspired me to give it another go.